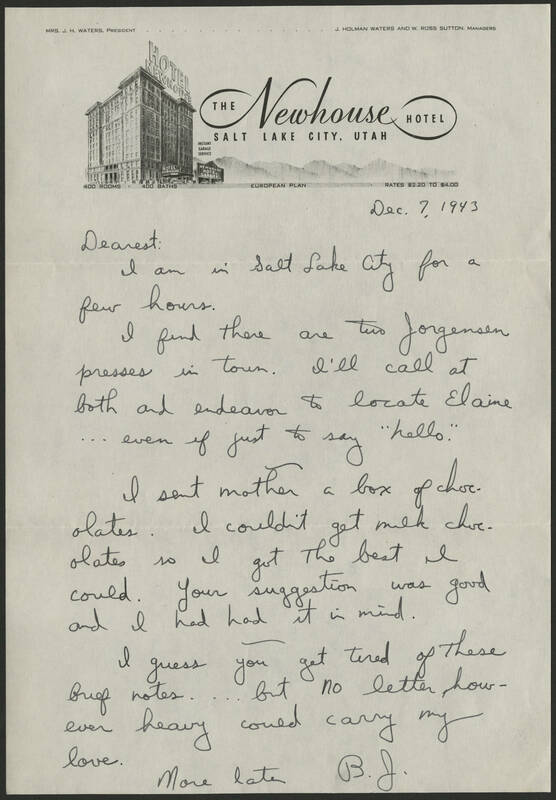 Salt Lake City, Utah Dec 7, 1943 Dearest: I am in Salt Lake City for a few hours. I find there are two Jorgensen presses in town. I'll call at both and endeavor to locate Elaine... even if just to day "hello". I sent Mother a box of chocolates. I couldn't get milk chocolates so I got the best I could. Your suggestion was good and I had had it in mind. I guess you get tired of these brief notes . . . but no letter however heavy could carry my love. More later B.J.